I am forwarding this desperate plea which was just received from one of our correspondents in South Africa. He is not a beggar, but is simply hoping to be heard, and hoping that somehow someone with authority in the American government will speak up on behalf of his people. These people deserve our help. They are our kinsmen, and are in danger of annihilation as it stands right now. If these Christian people were to become American citizens, they would contribute greatly to the betterment of America, and would NOT drain us of our resources as so many of the heathen immigrants have done. Please read the earnest plea below, written by someone who is there and is living the nightmare, and forward to as many people as you can. They are our kinsmen and many of them will not make it if their land is taken from them. I write to you today, with a very heavy heart, but with the hope that you might be willing to help raise awareness in the US for the desperate situation in South Africa. As you might be aware, the ANC government in South Africa has recently passed a motion in parliament by which they intend to seize all white-owned farms in South Africa – without any compensation. It’s all part of their insidious, communist plan to ultimately destroy all white South Africans and in particular the Afrikaans-speaking white community known as the “Afrikaner”. Of course this new law will pave the way to ultimately strip the White man of all his property & possessions. Their ultimate goal is to completely annihilate us as a people. It’s as simple as that. 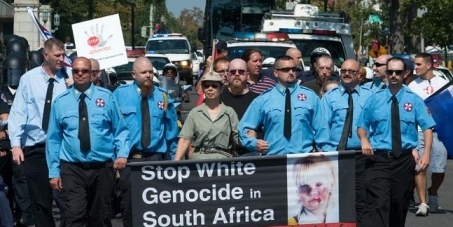 The ANC government has essentially declared war on the Afrikaner by attempting to legalize the wholesale destruction of the white minority in South Africa. This morning I read on Newsweek that a petition is being signed by thousands of white South Africans in which they ask President Trump to please help white South Africans to emigrate to America as refugees. I have no idea if President Trump will even respond to it, as this could become a “sticky issue” for someone who is currently committed to stopping the flow of illegal immigrants into the US; but if anyone can help, he can. This crisis needs his urgent attention as the situation for our people in South Africa is getting worse by the day. Farm attacks are especially bad, with white farmers being slaughtered without mercy. Whole families are being wiped out and nothing is being done to stop it. The liberal, government-controlled newspapers are not reporting these murders, so the rest of the world is not aware of the real extent of these gruesome crimes. Our people are really in a very desperate situation, where total annihilation is now a reality staring us all in the face. Through your reputation, I know you to be a bold and fearless preacher, one who won’t hesitate to call a spade, a spade. From my side, I just want to raise as much awareness in the US for our people’s desperate plea and our desperate situation. Would you be willing to help me in raising awareness of the South African crisis in some way? Perhaps you can also arrange for a petition to be drawn up in the US, so that the US government are forced to take note of what’s happening in South Africa and to speak-up on this terrible injustice being committed. Ultimately, I’m hoping that President Trump himself would speak up about this tragedy, as even a criminal government like the ANC would tread carefully around a man like President Donald Trump if he openly & publicly condemns this horrific injustice against the Afrikaner. They would be forced to sit-up and take heed of his disapproval and hopefully re-think this despicable criminal act. In the good old days, when South Africa was governed by our own people, under strict Christian principles, the rest of the liberal world were doing everything in their power to distort the truth and to petition their respective governments to force the white South African government to change their policies and start negotiating with these terrorists. Back then, the liberal world considered the ANC to be so-called “freedom fighters”, when in fact they were nothing more than terrorists. Over several years and through the eager efforts of countless liberal & socialist organisations and even socialist governments, South Africa and the Afrikaner was betrayed from within. After decades of peace & prosperity in South Africa, the country and her people, were suddenly left to the mercy of bloodthirsty terrorists. The result of that disastrous act is now very evident – except today nobody in the outside world seems to care anymore about South Africa or the ever-dwindling white minority trying to survive in the country that their Christian forefathers founded more than 360 years ago. The White man in South Africa, it seems, has served its purpose and is now dispensable in the eyes of world, but NOT in the eyes of our Heavenly Father who founded this once great country with Christian Protestants & Huguenots who, ironically, were also forced to flee from the tyranny being perpetrated against them in Europe. Unfortunately we are now facing another form of tyranny here in South Africa, but this time the majority of our people have nowhere go. The majority of white countries, it seems, are just not interested in helping their fellow kinsmen in South Africa. All white South Africans are desperately looking towards their fellow kinsmen with the sincere hope that our desperate plea would be heard and that help would finally come, but who out there will hear our cry and who will answer our call for help? President Trump has many supporters in South Africa and many are hoping he would come to our aid. I realize, however, that President Trump, as a man, is far from perfect, BUT yet he is showing more integrity, courage and guts than any of his predecessors. I’m therefore hoping and praying that he might act on his conscience and good sense to boldly speak up against the ANC, their heinous laws and the complete injustice being perpetrated against the defenseless white minority in South Africa. By doing so, I believe that he can indeed save our people from this impending doom and ultimately unite our Israelite people like never before and in the process restore the dignity of the White man who has brought so many blessings and advancement to the world. Please prayerfully consider what I’ve shared from my heart with you in this letter. Our people are in a desperate place and we urgently need help. We will not survive this blatant onslaught without the help of our fellow kinsmen in America. The Afrikaner and the White man of South Africa urgently need the help of our fellow-Israelites or else the Afrikaner will soon only be a sad and tragic memory in the long and troubled history of mankind. Thank you for your understanding and may God bless you!